The Qoyllur Rit'i festival attracts a large number of andean people from the surrounding communities who make an annual pilgrimage to the festival bringing large troupes of dancers and musicians. The festival consists of processions and dancing around the Lord of Qoyllur Rit'i shrine. 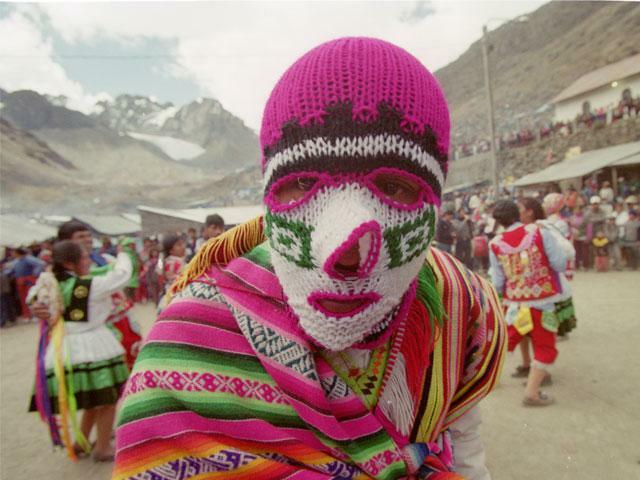 The main event is carried out by ukukus who climb a glacier below Mount Colquepunku. DAY 1: Transfer from Cusco to Mahuayani via the new Interoceanic road that joins Peru and Brazil. Pass through Ocongate, where we can admire the Apu Ausangate, main glacier and Sacred Mountain of the Vilcanota range. Once arrived to Mahuayani, start hiking up towards the Sanctuary of Qoylloritti, located in a breathtaking spot, surrounded by snow-capped mountains. We slowly hike through an uphill trail along which we will encounter 14 crosses that are venerated on the way; the last one is already located at the Sanctuary. Upon arrival, we will set up at our camp and enjoy free time in the afternoon. The display of activities at the Sanctuary is impressive, as well as the number of pilgrims attending this festivity year by year. In the evening, we can attend the mass at the Sanctuary, being two ceremonies, one at 06.00pm and the other at 08.00 pm. Camp at the Sanctuary . DAY 2: After an early wake up, we pack our bags and get ready for the pilgrimage. We will meet the Ukukus coming down from the glacier, after being the night close to the summit as a sign of devotion. At 10 am attend to the Blessing Mass and at noon, we leave in the so-called “24 hour procession”, together with the rest of pilgrims. The procession leaves from the Sanctuary and runs through Calvario Machucruz, the lagoons in Kumukasa and Alqamarina sectors, until reaching Yanacocha, where we arrive at around 06.00 pm. We then rest for 3-4 hours until 10.00 pm, and when the moon rises up, we start walking during the night towards Tayancani. Night hike where we will meet with 3 thousand devote dancers and enjoy the rising sun beyond Ausangate Mountain. It is a rough activity, but will be easier with our care and logistics support. DAY 3:Impressive morning dances to the Sun and the Apu Ausangate until arrive to Tayankani. In the village, enjoy and share the warmful and happiness of the pilgrims that came all the way from Qoylloritti. Rest, have a typical lunch and head back to Cusco to get ready for the Corpus Christi or continue with your travel activities. Horses to carry the camping equipment. Assistant Tour Guide (for groups of 9 or more people). Bio-degradable personal hand soaps and detergents. Tips or gratuities for guides, drivers, cooks, porters, etc. Comfortable walking boots with good ankle support. Clothes: long trousers (lightweight), T-shirts, short-sleeved shirt, long-sleeved shirt, pair shorts, Underwear and socks (thermal underwear is highly recommended, being light, warm and makes good nightwear on cold nights), Fleece jacket.